Cornea have a clean layout for their OSD that makes adjusting aspects pretty straight forward. 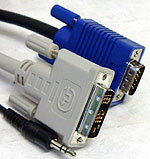 When the monitor is connected via the Digital DVI cable many of the screen adjustments are blocked out because they are not required for that type of signal. The main sections include; auto-adjust, brightness, contrast, position, image, volume, colour, language, OSD adjust, and miscellaneous. As with all LCD capable of analog-input, the best way to configure that method of connection to the computer is to toggle the Auto adjust key and just sit back. We evaluate the quality of TFT displays with the help of a program called Nokia Monitor Test. The software application displays a range of colours and test patterns that can help diagnose just about any visual problems or defects a TFT display may contain. It can also be a very useful tool for properly adjusting a display to the optimal settings. The software consists of eleven tests which can be run in steps as adjustments are made to the OSD. As the tests are run we look for the following problems, only one of which should be inoperable (broken pixel). There typically isn't much to say about the geometry of a screen when we are dealing with LCD's. The technologies inherent design means that test grids are displayed very true, and very sharp at their native resolutions, especially when using DVI signals. The Cornea CT1904 does well under native resolutions like 1280x1024 as we would have expected. There is very subtle shading differences between 1% and 9% white on the contrast test screen. The 205 through 100% also shows an even transition, but the 100% test square seems to remain a little gray. There is no perceptible bleed on the small white box test page, and the uniformity of the black is nice. The LCD glass doesn't have the greenish appearance that the previous Cornea LCD had, though there was at least one/half of a broken pixel visible. White uniformity is quite good, as are red, green and blue test screens. There were no visible dull areas around the outside edges of the screen, and only that one-half or maybe even 1/3 of a broken pixel visible to are critical eyes. The grid test patterns in RGB illustrate the worst case situations when different coloured pixels must work closely together. Since the pixels on the CT1904 are 0.294mm in size, the different parts of the pixel (RGB) they do not line up exactly on LCD screens where there is less blending between adjacent cells. Overall, the convergence of this display was excellent. This test has a few patterns of alternating black and white boxes with text in them. In the center of the page are two boxes with 1 pixel vertical stripes. All test patterns showed up perfectly - if you try this test on your monitor pay close attention to the center two gray boxes, where interference can sometimes be visible. Resolution was excellent at the native 1280x1024 setting under both analog and digital signals. We then reset the image size to 1024x768 and loaded up the resolution test pattern once again. Under those conditions the image dithering of closely spaced lines was less clear, though text was easily readable. Since we tested with the digital signal there were no problems at all with any of the Moire test patterns. Under an analog signal we did see some background waviness crop up on a couple of the 1pixel vertical, and cubed, test patterns. The LCD display on the Cornea CT104 is quite good under a digital signal, but not as much so under the standard analog connection. On most of the LCD's we have tested it has always been rather difficult to make the distinction between a digital or analog signal, but in this case it is visible. Ghosting doesn't seem to a be a problem with this display, and in testing with a full page of text there was no streaking either.